Within the project "Complementary courses about natural finishing" our professional Taavi went to two courses in London in July where several decorative and imitating finishing materials and techniques were introduced. 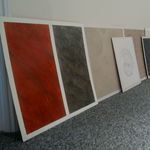 One aim of the project is to gain and develop the experiences in finishing techniques like stucco, marmorino, etc., with the purpose to carry out workshops about those topics ourselves in future and to introduce those materials and techniques. There were two 2-days courses visited in England in Joanne Poulton's Paint school. She is a professional who has a long practical work experience and has complemented herself in London, New York and Italy. Her works have taken her to Mauritius, Caribbean, America, Italy, Germany and France. Joanne is actively carrying out courses about decorative finishings. The first workshop was "The Polished plaster course", where several Italian decorative finishing techniques and materials (e.g. Oikos' materials Raffaello, Travertino romano, Marmorino naturale, Cera per stucco, etc.) were treated and also Moroccon technique tadelakt. The course was very practical and during two days all the participants could make seven samples that could be taken home later. The used materials were ready-made mixtures from Oikos, these are environmentally friendly, solvent-frees, very durable and easily cleanable. The mixtures consist mainly of marble flour and lime. On the first day the surfaces and first coats were prepared, on the second day were made the finishing layers and the surfaces were polished. The second workshop was "The Marbling and Stenciling with polished plaster course", where the focus of different decorative finishing techniques was mainly on imitative final finishings (e.g. marbling, stone patterns, etc.). The used materials were, for example, San Marco's products Marmorino classico, Grassello di Calce and Oikos' Marmorino naturale, Finitura autolucidante and different polishing waxes. On the first workshop day the surfaces and base coats were prepared, on the second day the final finishes were made with different tinted mixtures and with stenciling techniques. Also instructions were given how to make stencils ourselves and different finishing techniques were combined. It was very interesting to use different colourful waxes for imitating marble. During the course six different samples were made. This article reflects only the author's view and the NA and the Commission are not responsible for any use that maybe made of the information it contains.